Raab Associates’ new Guide to Customer Data Platforms is now available [update: as of 2014, we no longer sell it]. You may not find that news to be fall-off-your-chair exciting. In fact, you’re more likely to wonder whether the world needs yet another report on anything at all. Fair enough. So before telling you what’s in the CDP Guide, I'll tell you why it exists. 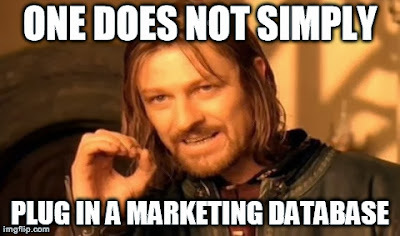 Simply put, marketers need better databases. If you’re a working marketer, you almost surely know this from personal experience. But someone who only read industry news and vendor promotions might think all anyone had to do was to plug in the latest cool application and it would immediately be filled with fresh clean data like water from a tap. Dirty big data is our industry’s dirty little secret. The problem isn’t new but it is getting worse. As customers interact across more channels, marketers need to not just meet them in every new location but recognize them and carry on a continuous conversation from one touchpoint to the next. Marketers can also become more effective by enriching that conversation with information from external sources such as Web pages, social media, and commercial databases. Both the carrot of better results and the stick of customer expectations are ever-more-urgently driving marketers towards building better databases. If there’s one absolutely critical point in that definition, it’s that CDPs put marketers in charge of building their own database. Taking control is the only way that marketers will ever get the databases they desperately need. It’s why CDPs are so important. But too few marketers know who the CDP vendors are, what they do, and how they differ. The Guide to Customer Data Platforms is designed to provide this information. If the CDP vendors are tour guides on the path to better data, the CDP Guide is the reviews you read to decide which one you’ll hire. As far as we know, no other study serves this purpose. Given its goal, the heart of the Guide is the vendor profiles: three to five pages on each vendor, describing capabilities for data management, predictive modeling, marketing campaigns, and message delivery, plus background on the vendor’s technology, clients, company history, and pricing. You’ll want to read those closely when you’re selecting a vendor. But first you’ll have to decide whether a Customer Data Platform is something to consider. Here is some information to help make that judgment. - CDPs are something new. CDPs are systems that help marketers build and update customer databases, and make those databases available to support marketing programs. That may not sound very new, but most B2B marketing automation products today build very limited databases while most B2C marketing automation products rely entirely on an external data warehouse. The systems that do build databases are designed to be used by IT departments, not marketers. And many CDPs provide predictive modeling or best-treatment recommendations that go well beyond the storage functions of a basic data warehouse. - You still can’t do this at home. CDPs may be tools for marketers, but that doesn’t mean that marketers build the databases themselves. Rather, CDP vendors provide services that build the database with varying degrees of marketer involvement. The difference is that the marketers work directly with the CDP vendors, instead of relying on IT staff that often has other priorities and an imperfect understanding of marketing needs. This makes it much easier and quicker for marketers to get the database they need. - CDPs are an outgrowth of existing system types. Most CDP systems were created for a purpose that happened to require the same database-building capabilities as a CDP. These purposes fall into three groups which I discussed in last week’s post, so I won’t repeat them here. They’re worth understanding because vendors in each group have a different set of skills, one of which will probably come closest to your needs. - Convergence is coming. Even though the CDP vendors started with different applications, their shared abilities for identity matching, database management, analytics, and integration will allow them to support more of the same functions over time. As marketers understand the value of their databases more clearly, CDP vendors will be able to focus on selling their data platform features rather than applications the platform supports. Of course, once the platforms themselves are common, vendors will climb the value chain by offering better predictive analytics and cross-channel treatment optimization. - Details count. CDP features may eventually converge, but for now the systems differ in many small ways that make a big difference. To take one example, nearly every CDP creates predictive models. But some can only predict response to specific promotions, based on who has responded before. Others can do the much more sophisticated analysis needed to predict which offer will best advance a long-term goal such as becoming a new customer. And even among those that model against long-term goals, some can actually estimate the incremental impact of a specific offer and others can just see most common correlations. We found similarly subtle differences in how data is collected (via the vendor’s own Web tags or by importing from other systems), the range of data sources (just marketing automation and CRM or those plus many others), natural language processing to extract useful information from text sources such as Web pages, how much history is kept and how it’s used, program execution, and end-user control. The CDP Guide clarifies these distinctions, but it’s still up to marketers to evaluate which differences will matter in their own business. The CDP Guide itself contains quite a bit of other useful information, including a formal definition of CDPs, detailed explanations of what to look for in a CDP, and a history of marketing databases starting with ancient Sumer (don’t worry, I skipped the boring parts). Again, the goal is to provide one package with everything you need to get started along the path of buying a CDP system. From there, it's up to you. you are on the money with this one. 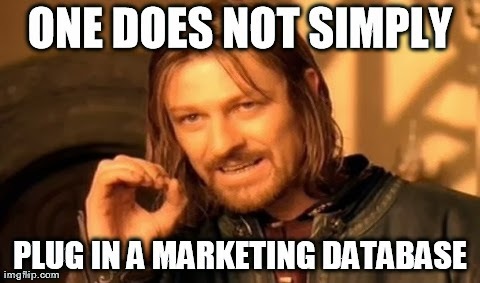 While most of us 15 years ago thought that the major problem in the future for marketing databases would be VOLUME of the SAME or SIMILAR data we got it wrong. Although volumes have gone up massively in some industries, most notably telco with sms and browsing, what really happened was the BREADTH of data has caught a LOT of people by surprise. In 1993 a data warehouse Version 1.0 with 300 data fields was better big. By 2000 a 1.0 data warehouse with 1,000 fields was pretty big. By 2002 it was already 2,000. By 2004 it was 9,000. An in 2006 I did my first 18,000 field version 1.0 operational data store. Thankfully I have not done a 1.0 release like that again! But the message is clear. Today 4,000-5,000 data fields in a 1.0 data warehouse is completely normal. 10,000 is not unusual. 20,000 is not unheard of. The extra touch points have generated data like crazy. And this has hit people where it hurts. ETL and data models. People are reacting with Hadoop and just "grabbing everything." You and I have seen people "grab everything and work it out later" plenty of times......does not work. So ETL and the data model have become more important today...hence my work in that area.